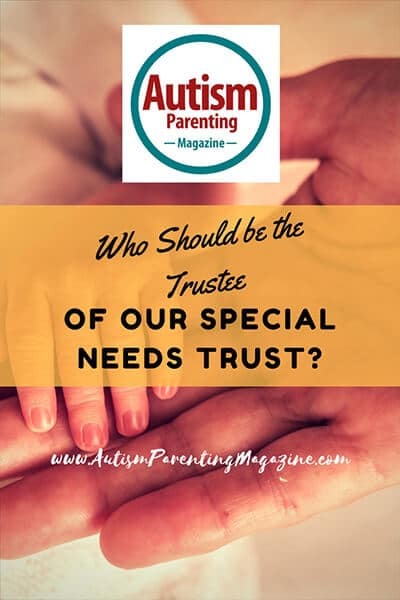 Who Should be the Trustee of our Special Needs Trust? Anthony asks: My son with autism is 14 years old and has a 10-year-old sister. We are thinking of setting up a Special Needs Trust, and would like to make our daughter the trustee. Is that possible? Thank you for your question. It is very common to design a trust with the trustee being a family member such as a sibling. At present time you would not be able to have your 10-year-old daughter be the trustee; however, when she becomes of legal age (18 years old) you can technically name her as a trustee. Based upon the ages of your children, it is best to name a trustee in your generation such as your sibling or a close family friend that is your age. As your family matures, you can adjust your trust in later years to name your daughter as the trustee. Most families do not have a family member who has the knowledge, experience, or technical expertise to truly handle the three major tasks of a trustee. It is understandable that you will want a family member or close friend to be the trustee due to the fact you will want the trustee to know your son so that the trust assets will be used for his life-long support needs. It is also important to provide your trustee with the tools necessary to fulfill their fiduciary role so that the intent of the trust is realized; a great life for your son. It is because of these reasons, you should consider having a Co-Trustee, an Administrative Trustee or at the very least an advisor that will guide the trustee in making the appropriate AND correct decisions when managing the trust. The success of your son’s Special Needs Trust depends on your trustee having the tools necessary to do the job!